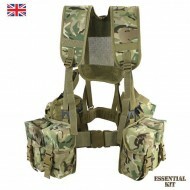 Kombat UK's Airborne PLCE BTP webbing set - ideal for Military, Army Cadets and Airsoft. The Airborne webbing set is built around a comfortable padded hip-pad and a wide shouldered yoke for maximum comfort and weight distribution when fully loaded. 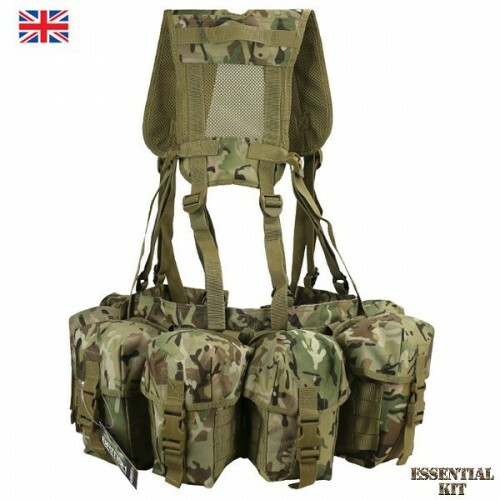 The shoulder straps on the yoke and the Molle belt are fully adjustable to allow you to get the belt kit in the most comfortable position. The pouches on this webbing set are removable and re-positionable, so you can customise your webbing to meet your needs. Fully padded and adjustable molle belt. 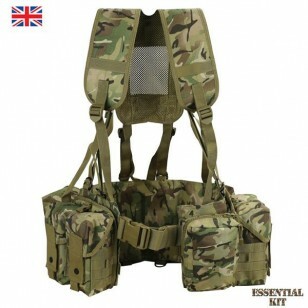 2 x 6 molle M4 double ammo pouches with velcro and press stud fastening. 4 x molle utility/water bottle pouches. Fully adjustable special forces airborne yoke. Made from robust and hard wearing 600D Cordura.